Here is my collection of accessories that makes the FT-817 more enjoyable. I'm always interested in clever ideas! Please share your best via e-mail. A picnic table portable operation. The personalized lunch bag holds a 17 amp-hour gel cell and all accessories except the clipboard/paddle. 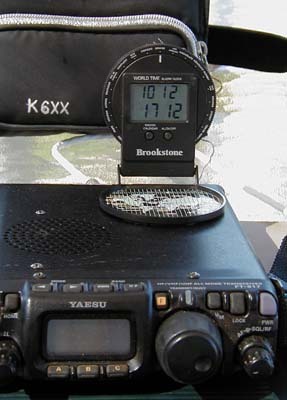 A 24-hour folding digital clock with magnetic strips on the cover sticks to the FT-817 top case. A case borrowed from a portable CD player is a perfect match for the rig. Nighttime illumination is provided by a fluorescent lamp (with excellent battery life) and a clip-on reading lamp. 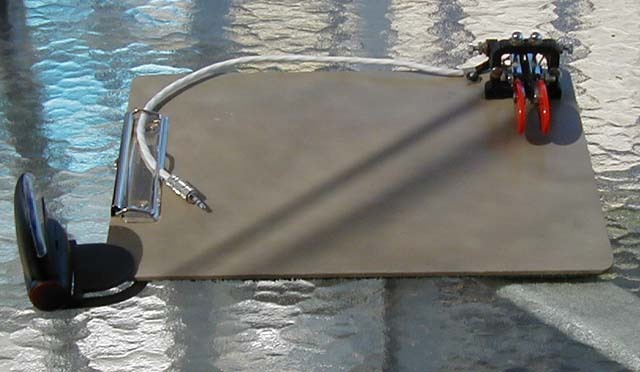 A clipboard with a iambic paddle bolted on top and a sheet of non-slip padded material glued on the bottom provides a stable work area for either the rig or logsheets. A modified HT speaker microphone is much smaller and lighter than the stock mic, yet its Heil HC-5 cartridge provides better sound. Custom cables are built for CW contesting, a boom mic with PTT input, and PSK31/MFSK/generic AFSK operation (windoze confuzer not included). It's nice to carry a dual time zone digital clock with you. This one unfolds and attaches to the top cover. Self-adhesive magnetic strips were fit on the digital clock base, which allowing attachment to the FT-817 cover. The CD player case is almost completely unmodified—it provided a perfect fit for the FT-817. A couple of staples through the CD case carry strap forms a tight loop suitable for carrying either the rubber duck antenna or a BNC-UHF angle adapter (as shown). Wrap tape over the staples to prevent catching the sharp staple ends on things. A low-cost clipboard was painted (for waterproofing) and drilled to accept an iambic paddle (Brown Brothers shown). 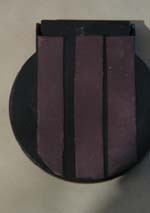 A sheet of non-slip plastic webbing was glued to the bottom surface. Originally intended to hold the logbook, it is now more often employed as a clean place to put the FT-817. A speaker-mic intended for a 2m handheld transceiver was modified with a Heil HC-5 cartridge and RJ-45 connector. The speaker element was removed and the audio output jack was re-wired as a PTT input. The electret element was retained because, on this version at least, it provides some structural support to the case. Compare how much smaller the speaker-mic is next to the stock mic. The modified mic weighs less than just the Yaesu mic cable! It is also thinner and offers better, more effective sound. The HC-5 cartridge is a good compromise between "punchiness" and "tinnyness", although the aggressive HC-4 cartridge will also fit. Custom cables allow quick mode changes in the field. The boom mic & PTT adapter has a rubber band around the RJ-45 connector to prevent breaking off the plastic "fishhook" locking pin that always seems to catch on everything. (The extra exposed wire is for toggling the FAST mode but is not implemented in this cable.) The PSK31 cable plugs directly into the DATA jack and the serial/audio jacks on a notebook PC. It works with any AFSK mode utilizing a PC sound card. 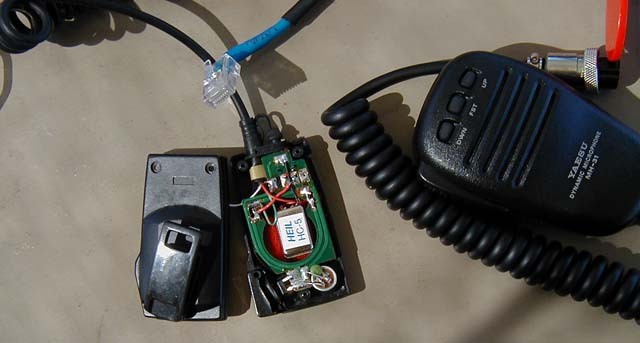 The CW keying and paddle cable interfaces a PC with the FT-817. Running the TR-Log contest logging program, the computer provides a CW keyboard, memory keying, a paddle-input keyer, and a PTT line (which helps save wear & tear on the FT-817's internal T/R relay. The contents of this web site are Copyright © 1995-2005, R.P. Wolbert and 26K Engineering. All rights reserved.